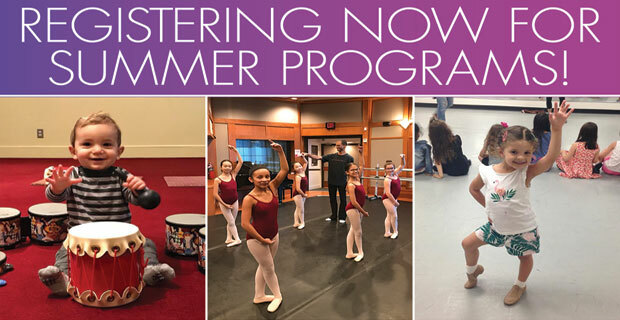 The Performing Arts School at bergenPAC offers multiple sessions for children and teens to explore musical theater and dance with programs that include a culminating performance for friends and family. The three-week Musical Theater program is for children ages 5-12 and features theater games, dance combinations, choreography, music appreciation, singing and more. Students of all ages can keep their dance skills sharp over the summer by taking one or up to seven Open Dance Classes per week. This targets beginner and intermediate level dancers looking to continue to work on their skills over the summer break. The two-week Dance Intensives for ages 10-17 are ideal for dancers who wish to improve their technical abilities, gain more confidence and a deeper understanding of their potential in a short amount of time. If not currently enrolled at The Performing Arts School, placement classes are available before June. Early Stars is an early childhood music program that provides developmentally appropriate music for infants, toddlers and pre-schoolers. This program is geared towards kids ages 3 months to 4½ years old with a parent or caregiver. The music program uses a mix of traditional and contemporary songs from around the world to bring out the innate musical nature of young children during 45-minute sessions.